Every year around this time the supermarkets in Florida are inundated with Mangoes. They start out a bit pricey, but as the season stretches on they begin to proliferate, and prices begin to drop. I love to eat them fresh cut, raw and unadorned, or chopped into a simple yet refreshing salsa with fresh jalapeno, red onion and cilantro. It's great as a topper to broiled or baked fish, or tossed in a taco with fresh cooked shrimp and cool crisp cabbage. From April to August, I seek out the smaller, sweeter, golden yellow Mexican Ataulfo variety, also known as Honey or Champagne mango. These are also great to eat right from the peel, but this year I decided to take my Mango-madness to new heights by cooking up some Champagne Mango and Meyer Lemon Jam. I was pleased with the results - Sweet and spicy mangoes melding with tart, fragrant Meyer lemons, with just a hint of ginger and cinnamon backbeat. Champagne Mango and Meyer Lemon Jam on toast. I'm still perfecting the recipe, and apparently mango can be tricky to thicken in jams, but I didn't use any preservatives or pectin, so if you try it, plan on keeping in the fridge for two weeks tops. Or make a batch, then invite the neighbors over for mango-jam topped waffles and blast through it all in one sitting! I like sweet and tart jams, so I upped the pucker quotient of this honey mango jam by adding not only the zest and juice of two small, lovely Meyer lemons, but the pulp of a third, chopped into small, juicy chunks. You can omit the chunks and reduce the lemon quotient to the juice and zest of one lemon if you want a sweeter outcome. 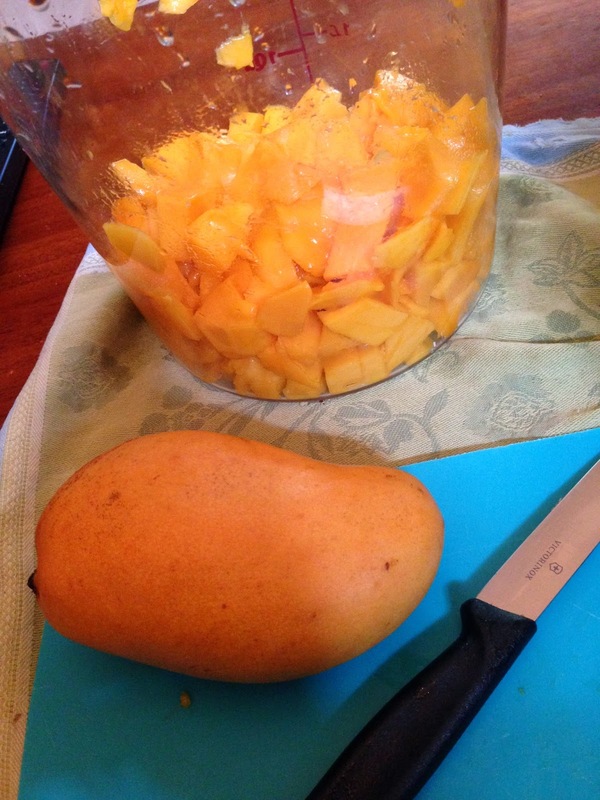 I also added a little spice – you can omit these if you want, but I like how they punch up the mango’s exotic flavor. Set a small plate with four teaspoons in the freezer. This will be your test for doneness. Wash, peel, seed and chop the mangoes. Keep the chunks as large as you’d like to see in the finished product. Alternately, you can puree the finished jam for a smooth consistency. In a large, non-reactive pan, mix the chopped mangoes, sugar, ginger, cinnamon, cloves, lemon juice and pulp. Set aside for 15 minutes. Cook mixture on medium low, stirring occasionally, until sugar is dissolved, then add the lemon zest. Continue to cook for 35 - 40 minutes. Test for doneness by pulling one of the spoons from the freezer, loading a small amount of the jam onto the spoon, then replace it in the freezer for 1/2 minute. Pull it out and check how solid the jam is remaining. Does it coat the spoon, and stay solid when you turn it slightly? It’s done. 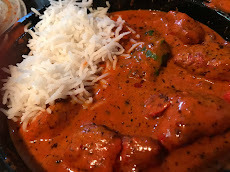 If it is still loose and weepy, keep cooking. Test this way until it holds together but remains soft. It will firm up a little more when it cools. When done, remove from heat and allow to cool completely. When the mixture is cool, ladle into the jars and close the lids tightly. You can proceed to canning these for long term storage, or simply pop into the refrigerator, where they will keep for up to 2 weeks. My ten small mangoes yielded just over 2 wide-mouth pint jars full. Fun Fact: In the 1700′s, the word mango was used as a verb meaning to pickle. For a time, anything pickled was called a mango, including peppers. This misuse of the word continued well into the 1970s in parts of Ohio and Pennsylvania. When groceries carried actual mangoes, the sign would sometimes read "Fruit Mango" so as not to confuse shoppers. Does this lovely Spring weather awaken your desire to dine al fresco? This week, First Coast residents and visitors have the opportunity to do so in a place so exclusive, it’s only open six days a year! 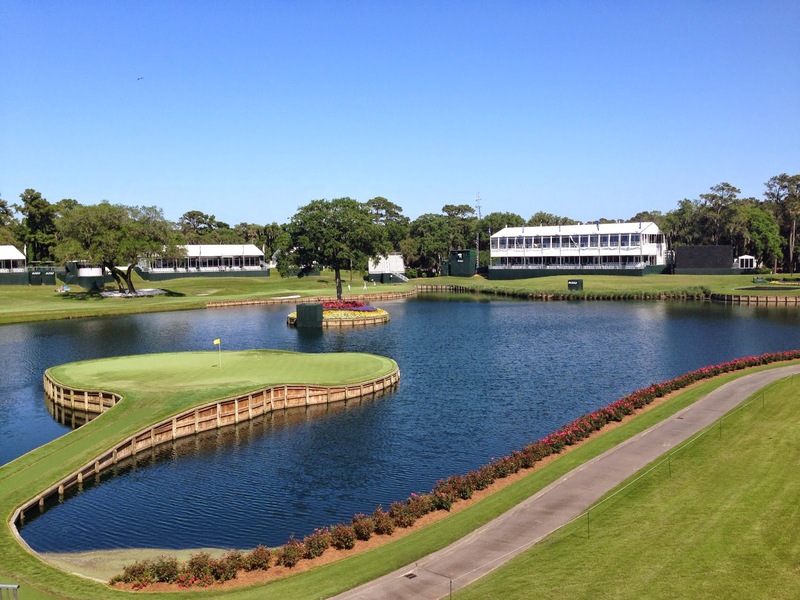 THE PLAYERS has returned to THE PLAYERS Stadium Course at TPC Sawgrass, May 6-11 in Ponte Vedra. Here’s a quick, and by no means comprehensive look at the dining options that await golf fans this year. Wine & Dine on 9 - gourmet small plates prepared by Matthew Medure, one of Northeast Florida’s most renowned chefs, in a beautiful garden setting - also features BERINGER® Wine Bar. Trucks on 10 sports some great-tasting dining options from six of your favorite local food trucks: Mama’s Food (Argentinian-style cuisine); Baby’s Badass Burgers (gourmet hamburgers); Corner Taco (semi-swanky street food); Gourmet Aviator (Latin-American and Caribbean cuisine); Up In Smoke BBQ (Southern barbecue); and Super Food (new American cuisine). 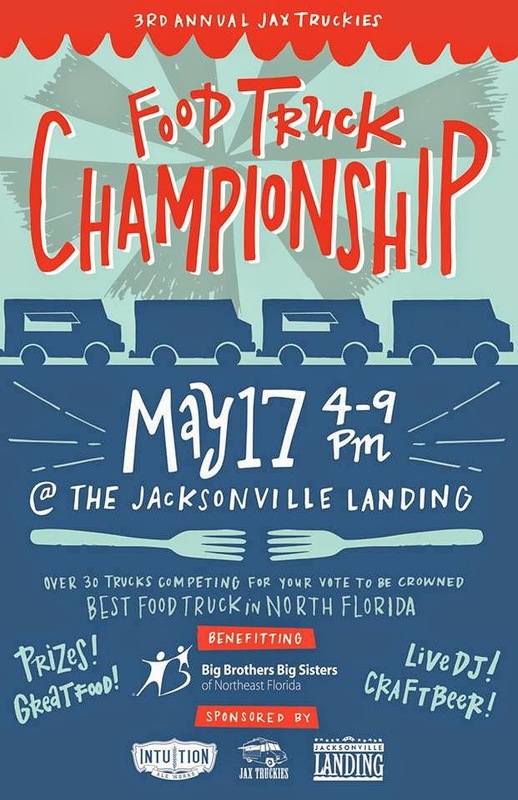 Located between 10 fairway, 11 fairway and 15 green, this public venue also offers an open-air, centrally located Michelob ULTRA Mobile Bar, outdoor seating and an upgraded restroom. Mama’s Food’s Chicken Quesadilla wins our (in no way official) food blogger’s award for great flavor. 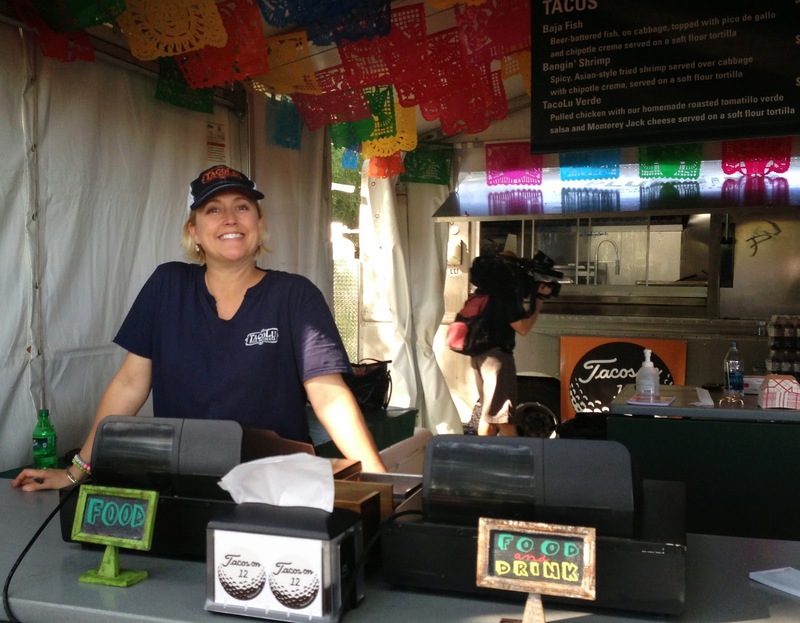 New this year, TacoLu, Jacksonville’s most popular go-to taco spot, will bring their own Baja style outdoors flair to The PLAYERS at Tacos on 12. Seating and shaded areas located between 12 green and 13 tee will give fans the chance to rest, relax and enjoy some of “the Lu’s” delicious menu items. There’s even a designated selfie spot for snapping photos TacoLu style. Try the Verde, Bangin’ or Baja tacos – always made with the freshest ingredients. 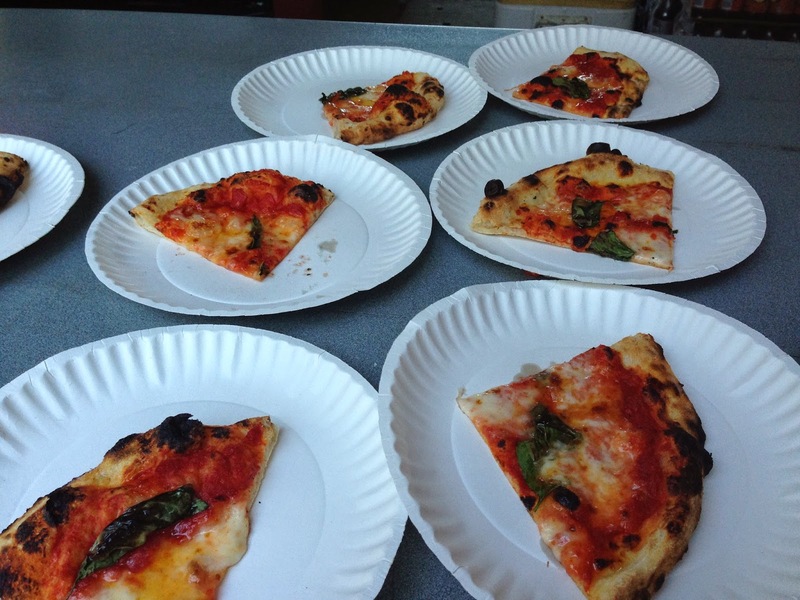 fare); and Pele’s Wood Fire (modern Italian-American cuisine). Located between 11 green and 12 tee, this public venue also offers a Bacardi® open-air bar, permanent restrooms and video boards to keep up with the tournament action. 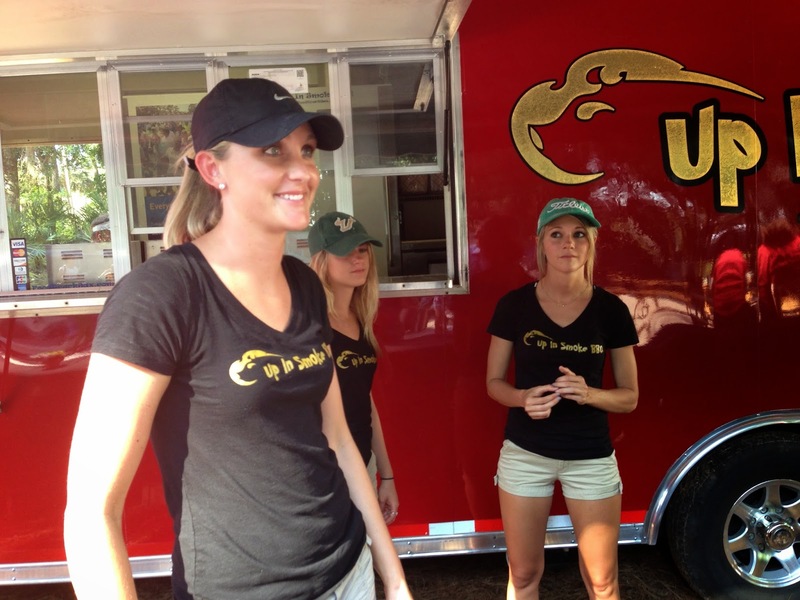 Insider tip: The Reuben Egg Rolls from Culhane’s Irish Pub are tasty, and oh, so portable! The Food Court has been relocated to behind No. 16 green – near the Couples Gate, which provides more shade. You’ll find plenty of choices to satisfy everyone in the family: Winn Dixie Fresh Café (new in 2014, featuring fresh-made sandwiches, gluten-free and healthy food options); and Bono’s Pit Bar-B-Q; Brucci’s Pizza; Firehouse Subs; MShack; and Tropical Smoothie Café. Get your food, then stake out a shady spot at The Grove, an outdoor, shaded area located behind No. 17 tee. The expanded venue includes pavers, tabled seating and a large video board showcasing the Golf Channel and NBC broadcast you won’t miss any tournament action. It’s hard to beat the views and atmosphere around No. 17, the most iconic hole in golf, but this year, thanks to the addition of the Sea Best 17 Deck, fans have a bird’s-eye view of the island green, No. 16 fairway and green as well as the 18th tee box. Open to the public, The Sea Best 17 Deck is a bleacher behind No. 17 green with a covered deck, misters to help fans stay cool, and a menu featuring Sea Best seafood. Try the Sea Best Shrimp Wrap and one of this year’s signature libations featuring Grey Goose Vodka. Hang out on the Clubhouse Lawn! If you have an upgraded Clubhouse ticket, don’t spend all your time indoors! 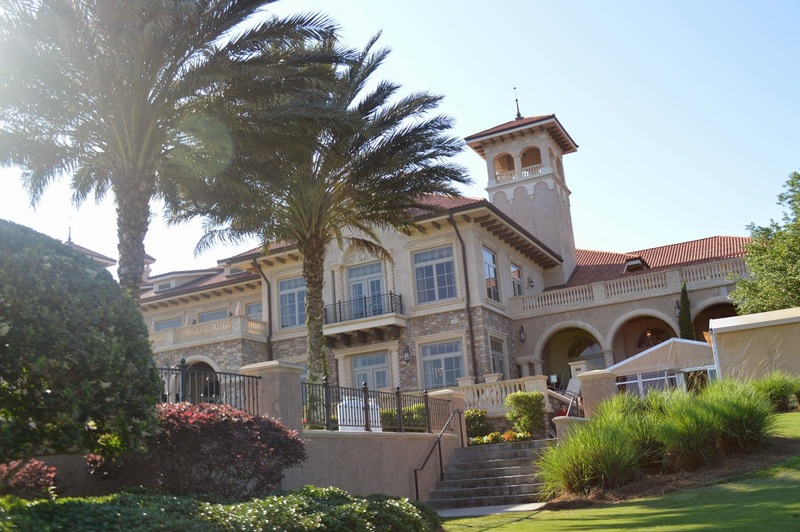 Hang out on the Clubhouse Lawn and enjoy food and beverages, available for purchase from award-winning TPC Sawgrass Nineteen. In the shadow of the beautiful 77,000 square-foot clubhouse, the lawn offers ample chairs, umbrella tables and a view of No. 18 green. New this year, the Michelob ULTRA Blue Room VIP Lounge is an exclusive venue located adjacent to Stadium Village. Tickets to the Blue Room include access to the grounds, as well as beer, wine, soda, water and upscale cuisine from select local restaurants such as Black Sheep and Mellow Mushroom. The Blue Room features outdoor games, music and themed days for a different experience each day of the tournament. Daily tickets cost $100 for Thursday; $125 for Friday; $125 for Saturday; and $100 for Sunday and are available exclusively on www.THEPLAYERSBlueRoom.com. Pro tip: Drink water, lots of it. Chilled, filtered drinking water is available in the permanent restrooms near The Patio, Taste of JAX and Wine & Dine on 9; so keep that bottle and refill it as many times as you’d like as a way to stay hydrated and save money at THE PLAYERS. Thanks to THE PLAYERS for inviting me for a complimentary Taste of THE PLAYERS event so I could sample and snap some of the best of the best to share with you!